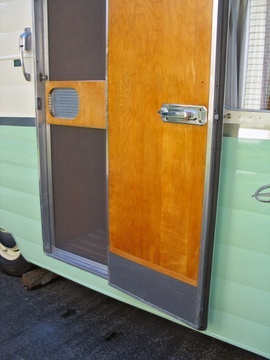 A section of metal added to the base of the door on the push side, that protects it against scuffing or damage, such as from being pushed open by a person's shoe. Kick plates are usually 10"-16" tall and the width of the door. Taller kick plates should be used where wheelchairs are frequently used, so that the foot rests come into contact with the kick plate and not the door surface above. Adding a kick plate to a storm door will cost about $20 to $50.